The flowers appear in mid-season. They are light rose to mauve pink trusses on a compact plant. 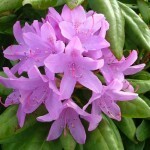 It is a vigorous grower and does well in many situations. H-1. It prefers partial shade to full sun, and moist, cool, acidic well-drained organic soil. Removal of spent blossoms encourages new growth and future flowers.